Discover Boating | Lake Simcoe Marine Ltd. The Discover Boating Safety app is a must have for all boaters in Canada. Nearly half of all Canadians spend time on the water. This app ensures boaters have relevant, easy to use, helpful and up-to-date information about safe boating practices. Use our Discover Boating Safety app to promote boating safety and also provide customers/boaters with all of the essential resources for boating in one place. The app includes weather resources, safety information, checklists and emergency contacts, among many other things. There are many different ways to promote this app by using the resources on this page. You can include these download links in your newsletters, on your webpage, social media or any other place you feel fit to promote it. Of course the Discover Boating Safety app is FREE and available from the Apple and Google Play stores. Lake Simcoe Marine's Commitment to the Environment. Lake Simcoe Marine has achieved a 5 Diamond Anchor Rating! We are doing our part to ensure that we have a clean and healthy environment for our enjoyment today and for future generations. 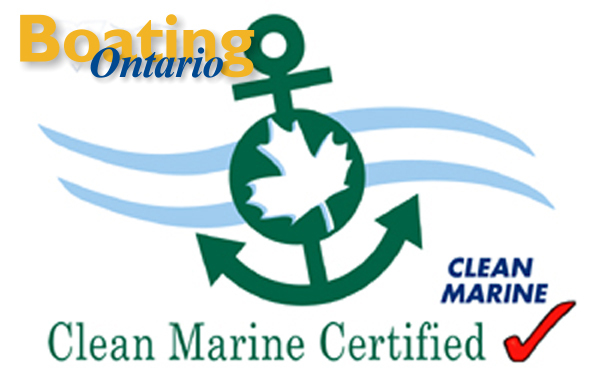 Ontario Marine Operators are voluntarily joining the CLEAN MARINE PROGRAM and following the operational practices mandated by this exciting environmental program. Each Marina is audited and given an Eco-Rating based on their environmental practice.